Where can I buy Kit Williams’ paintings? Kit’s works are still handled by The Portal Gallery in London, although folks have written in to suggest that he rarely displays there any more. “Kit apparently now works only to commission but he also opens up his studio once a year to the public for one week only to display recent works,” says Toby Malcolm. “You can get an invite by writing to Kit via the Portal Gallery who are still more than happy to forward mail to him.” If you want to comission Kit, expect to pay a lot for his custom creation! Works that have already been sold (as many, if not all, of the Masquerade paintings were) are sometimes auctioned off through Sotheby’s or Christie’s. Expect to pay even more. (thanks to Toby Malcolm for that). 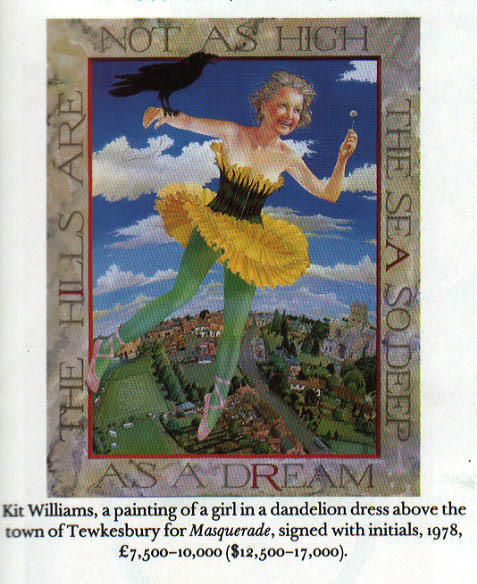 Previous post: Where can I buy posters or reproductions of Kit Williams’ paintings? Next post: Where can I buy Kit Williams’ books?